That’s right, you can go and bid on this intact 1944 P-51D Mustang that has not flown since the 1970s for same price as an entry level base Ford Mustang! This oxidized example of North American’s legendary WWII fighter has been untouched for over ten years but has been stored out of a elements in a hangar. Tail, horizontal stabilizers and cowlings removed; Canopy has crazing and discoloration; Paint oxidized; Cockpit and engine compartment has corrosion and metal degradation. All avionics and electrical wiring in the cockpit appear to be corroded and degraded. All instruments, faceplates, and gauges require refurbishment or overhaul. The aircraft requires full restoration. Also included in sale are (4) Yellow Aircraft Jacks, (1) Gray Jack, (2) Propellers, (1) Newman Compressor, (1) Box of Straps, (1) Appliance Dolly, (1) Red Tank, (1) Fedders Air Conditioner. Don’t rush but you better hurry, because the auction starts on June 2nd at Torrance Airport in California. 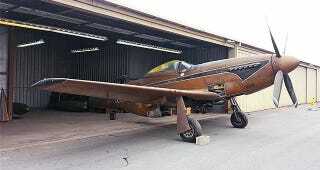 There is also a spare Packard Rolls-Royce Merlin engine up for grabs and some Ryan PT-22 engines, props and seats. You may even be able to sell some of that stuff to Harrison Ford. This Rustang is an ideal restoration project for anyone looking to add P-51 to their aircraft collection. Considering that people are nearly building these from scratch now, this fighter is really in pretty damn good shape. You don’t even have to fly it, you could use it as a decorative piece in your mega mansion or try and make a few bucks on the flip and find a Applebees franchisee who wants the best piece of restaurant flare ever. So tell little Jimmy that his first car will be a bus pass instead of a base Mustang and use your cash to get inside the bidding circle on this rare aviation relic.